Walter Frank Mehrkens was born in Kidder County, North Dakota on October 4, 1922. He was the first child of Fred & ElsieMehrkens. His parents farmed near Minotco, North Dakota in a German Community where everyone spoke German. Their main crop was wheat. and they had a tough time understanding each other. In 1935, the family moved to a farmin Bear Valley near Mazeppa. There, Walter attended Bear Valley School through the Sth grade. The family attended Bear Valley Lutheran Church and Walter helped Fred on the farm until he graduated from gth grade and turned 14. He then moved in with his uncle,George Mehrkens, to help him as a farm hand. In addition, he worked for Art Zemke, Fred Kuel, Art Dammon and Arnold Windhorst. Until he reached IS, all of his wages were turned over to his mother and father. In the meantime, Fred and Elsie had added an additional 3 kids to their family. 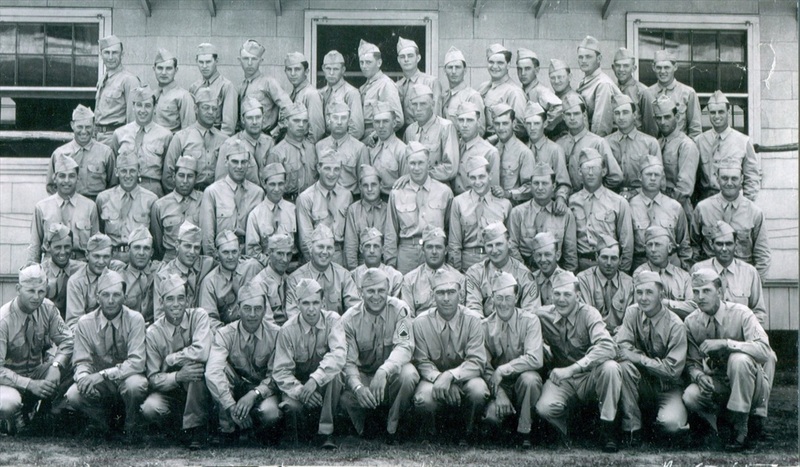 In 1943, with World War II well underway, Walter was drafted into the army. He went to Croft, South Carolina for his basic training. He decided to become a Para-Trooper, since that resulted in a $50.00 raise in his pay, and went on to Fort Benning, Georgia to complete that training. 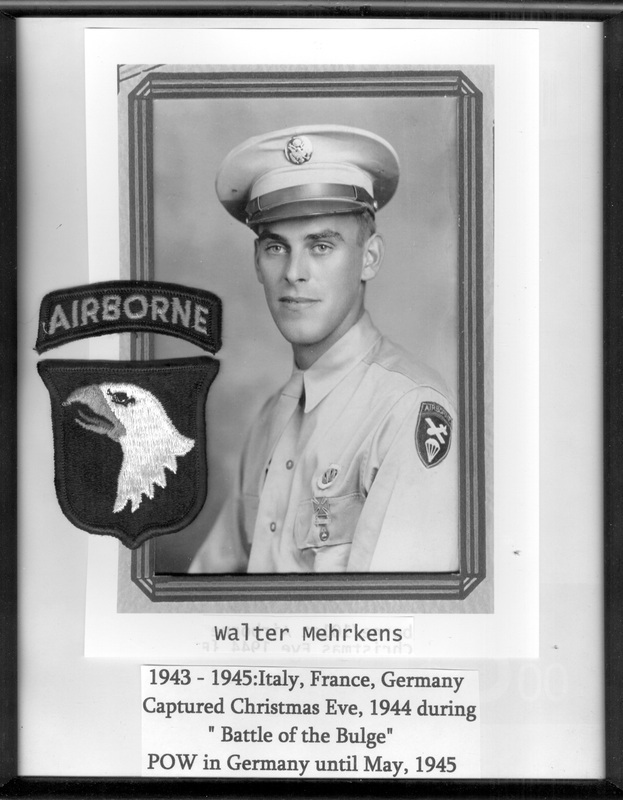 Walter was a member of the 517th Airborne Division but was attached to the 101st Airborne. Walters's first overseas duty took place in Italy. He was there for a short time and that assignment was fairly uneventful. Subsequently, he was sent to Southern France near Nice where he was on the front lines up in the mountains for approximately a month. Artillery barrages were a daily event. The soldiers would sleep in bunkers. Supplies were brought to the front lines by donkey. The men would walk in trenches while pulling the donkeys on a rope. All the while, the German's would be shelling the area. His group was granted a reprieve from their duty on the front lines and sent to Reams, France for some rest. American Japanese soldiers took their place in the mountains at that time. While on R & R, the German's counter-attacked in Belgium in an offensive later called the Battle of the Bulge. Walter and his unit were sent to Belgium to help repel the German advance. On Christmas Eve 1944, Walter and some fellow soldiers were guarding a road with rifles. During the night, a German tank overtook their position. One of his fellow soldiers took off running and they never saw him again. Walter and two others, one a sergeant, hid in the woods. However, the next day, they were discovered by the German's and taken prisoner. After that, Walter never saw the sergeant again. Walter was locked in a small room in a church where a German officer subsequently interrogated him. The officers seemed quite upset because Walter had a German name but was fighting with the Americans. Walt and the other prisoners were subsequently marched for a week, on foot, toward Berlin. After a week of walking, they were loaded into a boxcar with a total of 50 men packed in. There, the prisoners were made up mostly of English. Their only latrine facilities were 5 gallon buckets. Some of the prisoners ate snow and subsequently died from diarrhea. The group eventually reached the German prison camp located approximately 50 miles south of Berlin. The prison camp consisted of approximately 30 buildings with 1000 men in each, making a total of 30,000.00 prisoners. The prisoner's bunks were 3 high and contained straw mattresses. The Red Cross provided packages to the prisoners once a week, which were delivered by the Swedes. The packages contained cigarettes and a chocolate bar. Walt and some of the other prisoners would trade the cigarettes with the German guards for potatoes. railroad. One day while doing so, allied bombers started dropping bombs on their work. At first, the guards took off running but the prisoners were not far behind. With such bombing, the Germans finally gave up on having the prisoners re-build the rail lines. While at the prison camp, Walter doesn't remember if he ever shaved or not. He does remember he and other prisoners being treated for lice. On April 23, 1944, Walter woke up in the morning and all of the German guards were gone. Russian soldiers on horseback were riding through the camp. Many of the prisoners scattered. Walter and a Polish prisoner, Beji Rocherfl went to a nearby abandoned farm house and found a ham and some eggs in the basement. That was their first decent meal in months. After eating, they looked through the house and found five German soldiers in a bedroom shot dead by the Russians. Really having nowhere to go, they went back to the camp. The Russians told them that the Americans would be coming to get them. They stayed two days, but heard rumors that the Russians were going to hold the American's for ransom. So Walter and Beji decided to take off and they started walking toward the Elbe River. They celebrated Md' Day with the Russians on the Russian side but made it to the American lines by May 2nd. Once they crossed the Elbe River over into the American sector, they were fed white bread. Walter remembers that it tasted just like angel food cake. a couple of days, he had made it home to Bear Valley. and hauling milk, together with picking up odd trucking jobs, he met Maxine Adams. With that, he started the next chapter in his life.